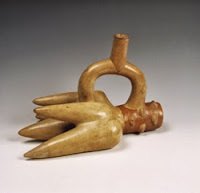 As stated in my last entry, I am in the passionate throes of a love affair with Andean fruit that is depicted in ancient art. I spend my mornings roaming the markets of La Paz looking for my beloved eats and feeding my respect for the Moche’s ability to depict absolutely everything in either pottery or metal. In this second review I have been a bit liberal with my use of the word “fruit”. Let’s just go with ‘plant bits’. Choclo is a type of corn/maize that is less sweet than the sweetcorn you are used to. It is characterised by a strip of farm-style cheese that grows within the husk, snuggled up to the engorged kernels. 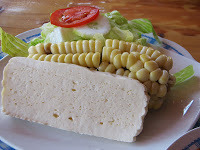 Yes, the con queso variety of choclo is a post-Conquest mestizoisation (possibility of llama cheese? anyone? ), but like peanut butter and jelly, like butter and popcorn, like hamburgers and french fries, like vodka and cranberry, this confluence of the New and Old World is better than the sum of its parts. Alone the cheese is too salty. Alone the choclo is too plain. Together they are (and were) my lunch. 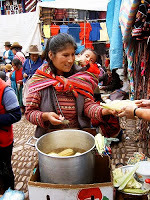 Choclo is best consumed on the side of the road in the high Andes during a break in a 36 hour bus ride. It should be boiled, cheesed, and re-husked. You should eat the choclo with no utensils, ideally while watching a herd of wild vicuña scamper across the inter-Andean plain. Vegetarians, this is your go-to snack while traveling: you are not likely to find other street food that is not meaty. Yuca (aka cassava or manioc) cultivation requires the least amount of effort of any cultivar that I have encountered. 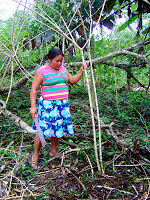 You grab on to a yuca stick, yank it out of the ground, chop the tubers off the bottom, break the stick into several pieces, shove the pieces into the ground, and more yuca grows. Nothing else needs to be done. The time trade-off is the post picking prep. If prepared wrong, there is enough cyanide in yuca to really mess you up. 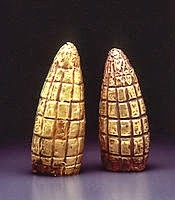 We are talking goitres that I imagine are shaped like yuca tubers. 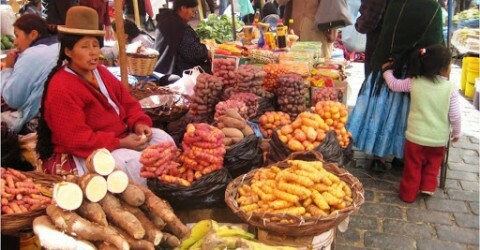 The more bitter the yuca variety, the more poisonous. To get around this, I have seen yuca grated and then squeezed and squeezed until nearly all liquid is gone. The other option is just to boil the heck out of it before, say, frying it. And fry it you should! As a rule of thumb, yuca can be used anywhere that one would normally use a potato. Move over home-fries, yuca has hit breakfast. Yuca is more fibrous than a potato and has a distinct non-potato taste. I’d take yuca over potato in nearly all circumstances. For over a decade now I have traded whatever papaya (gross; see below) I have been given at breakfast for someone’s yuca. I cannot fathom why someone would make that trade but their loss is my gain. Possible “vertigo, vomiting, and collapse” from the cyanogenic glucosides? Worth it. I hope that you readers appreciate my sacrifice. For over a decade the papaya and I have had issues, but I would feel like a cheater if I reviewed it from memory alone. So today, for you dear reader, I bought the smallest piece of papaya possible and forced myself to eat some of it. Papayas have some things going for them. They are ubiquitous in Latin America and very affordable. I long to spend 20p on one massive papaya and eat it for days. They look amazing on the tree, growing in a big clump up and around the trunk. The flesh of the papaya is the nameless orange/red/pink/yellow colour of sunset. 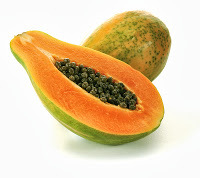 Their leaves, seeds, and perhaps even flesh have abortive and contraceptive qualities (papaya only education?). Also, Wikipedia says that papaya can be used as hair conditioner which makes me feel better about not eating any more of this unpleasant thing. I will just squish it on my head later tonight. The papaya starts out good: you can scoop the flesh with a spoon and the initial taste, if weak, is at least fresh. Unfortunately the good doesn’t last long: within a moment I am hit with a difficult to describe aftertaste. I want to say that it is fleshy or meaty, but it really isn’t. Those are the adjectives that I came up with when I first tried papaya years ago. I can’t shake them. I think that my main problem with papaya, besides the aftertaste, is that it is neither tart or sour like the best fruits (my kingdom for a mango, pineapple, tamarind, or sour sop), nor does it it have some unique flavour that alone justifies a presence in my fruit bowl (think avocado, coconut, or, if you have been blessed, cashew fruit as wine). Papayas aren’t outright gross like chirimoya and I eat them when I must, but I won’t be buying another one unless this one makes my hair look luscious. 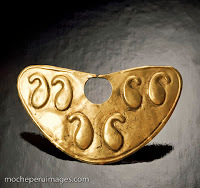 *Note: the fruit depicted on the Moche nose ornament is the mysterious ulluchu. Some identify it as the wild papaya.